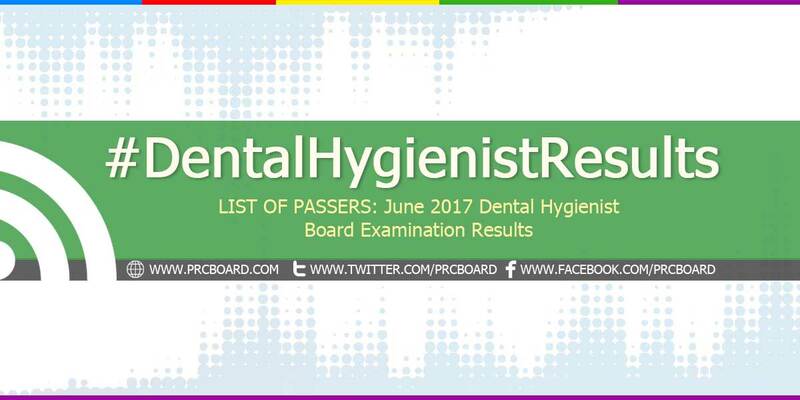 MANILA, Philippines – The 'June 2017 Dental Hygienist board exam results' together with the list of passers, top 10 examinees, top performing schools and related announcements are available at this website as PRC officially released the results online two (2) working days after the last day of board examination. As announced, 36 out of 47 passed the exams. The licensure exams are administered by PRC Board of Dentistry headed by its OIC, Dr. Rannier F. Reyes and its members Dr. Gloria M. Bumanlag, Dr. Melinda L. Garcia, Dr. Roberto M. Tajonera and Dr. Maria Jona D. Godoy on June 15 & 16, 2017 at PRC testing center in Manila. According to the Commission’s Resolution No. 2016-1019 series of 2016 entitled “Schedule of Licensure Examination for Year 2017”, the target release date of June 2017 Dental Hygienist result will be in two (2) working days after the last day of board examinations or by June 20, 2017 (Tuesday). However, results may also be released earlier or later without prior notice. On the same exams conducted by PRC on June 2016, results were released after seven (7) working days. On June 2015, results were out after six (6) working days while three (3) working days during June 2014. The 2-days exams covered topics from Basic Medical and Dental Sciences (General Anatomy 34%, General and Oral Physiology 33%, General and Oral Pathology 33%), Clinical Dental Subjects (Oral Diagnosis and Treatment Planning 25%, Anesthesiology and Pharmacology 25%, Roentgenology 25%, Dental Jurisprudence and Practice Management 15%, Basic Computer 10%), Clinical Dental Subjects 2 (Periodontology 40%, Pediatric and Orthodontic Dentistry 20%, Other clinical dentistry subjects 40%) and Practical Exams. Dental Hygienist is one of the programs with less number of examinees being administered by the Professional Regulation Commission. During the most recent Dental Hygienist board exams conducted June 2016, 34 out of 40 examinees passed. Jazza Benice Noquez Umila from National University (NU) - Manila ranked first garnering 84.49% rating followed by Kathleen Bunque Navarro and Giana Louise Bobadilla Ravanes, both from De Ocampo Memorial College having 80.89% and 80.67% respective ratings. On June 2015 of the same exams, 32 dental hygienist out of 53 examinees passed. All three highest places were from NU Manila. Nathalie Adrinao Nicomedes topped with 81.82%, Sherr Turbanada Bulagnir with 81.61% and Elizabeth Jamero Sumayo with 81.25% rating. Meanwhile, below is the statistical table of Dental Hygienist examinees, total number of passers and overall passing rate in the last four (4) years, courtesy of PRC. To receive up-to-date news about June 2017 Dental Hygienist board exam results, we advise our visitors to bookmark this page, visit PRC official website or follow us at our social media pages via Facebook and Twitter.